Our little tearoom has been highly rated by Tripadvisor for many years now in recognition of our high level of customer satisfaction. We have also been awarded their Certificate of Excellence for 2014, 2015, 2016, 2017 and now 2018 too! We are open everyday except Monday throughout the year from 10 o’clock in the morning, our little tearoom has its own little courtyard seating area, perfect for better weather days. You will find us just opposite the market area in the High Street, in The Little Barn Courtyard. We are a bit tucked away, out of sight, but that’s why our customers often refer to us as “A Hidden Gem”. Spring is almost with us, which means the last hurrah of Winter is still able to upset some of our outdoor plans. However, a brisk walk with a nice hot beverage and a snack at the end of it, is a very enjoyable experience and is great for driving the cobwebs away. Many of our visitors pop in after a cycle ride, a ramble along The Ridgeway, or even a gentle climb up to Coombe Hill’s viewpoint and back. If you wrap up warm and pull on a pair of walking shoes or boots, there is no better way to keep fit than a brisk walk with some good company. Some people decide to cut down on all the nicer things as a penance for all that seasonal enjoyment. It might shed a few pounds, over time, but you only have the one life, fasting doesn’t make you any fitter. Why not burn a little off instead and then you can afford to enjoy the nicer things in life too. The Lady Grey looks forward to giving you all a very big, warm welcome so make a date with us and a nice pot of tea, you are always very welcome! 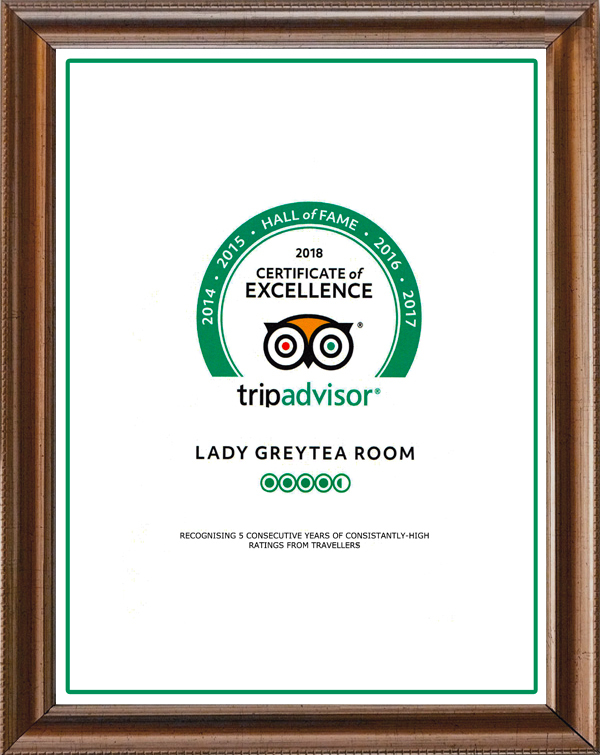 The Lady Grey staff are truly delighted that our customers have helped us to achieve our Fifth Consecutive Annual Tripadvisor Excellence Award which has meant that we have joined the TripAdvisor “Hall of Fame”. We constantly strive to produce the best possible experience for our customers and it gives us great pleasure to be rewarded for those efforts. When you receive recognition by your clientele there is no better accolade, so thank you so much for your support! "Thanks for lightening up our afternoon!!" Came here for tea with my wife to this lovely cute tea rooms. They have a lunch menu until about 2:30/3 after which they do cakes and scones only. We tried the plain scones with clotted cream (was homemade) and jam. They were delicious so we ended up having an extra one and took two more take away! The tea was lovely and they use loose tea rather than tea bags. The staff are friendly and approachable. I would recommend anyone passing through the town to visit this place. I’m writing to recommend this delightful cafe to everyone but especially coeliacs and those intolerant to gluten. There were a number of gluten free cake options and you can also order gluten free scones for a cream tea. For those who are lactose or dairy intolerant, the kind and smile staff also had soya milk for me for my tea. A charming spot to rest from our cycling. Many thanks to the Lady Grey staff. We visited The Lady Grey Tea Rooms on Saturday afternoon and were so impressed we went back on Sunday. What a fabulous little tea room, tucked away behind the antique centre in the middle of Wendover, so pretty and restfull. The proprietor has apparently been supplying this establishment with Cakes and other fare for some time and then took over the lease at the beginning of April. I was out with my sister and a couple of friends last Friday, and we set about finding a tea room for a late morning tea and cake. We regularly try different places for a catch up, but we will be looking no further now- this place is the best! Cute décor, most friendly and personable staff, and (most importantly) delicious cakes! My Granny and I have been to Lady Grey three times in the past month for a spot of lunch over the weekend and have been bowled over each time. On all occasions we’ve been served quickly with a smile, and we’ve enjoyed everything we have managed to try so far — delicious sweet and savoury scones, best quiche I’ve ever had, and really special cakes. So pleased we’ve found it – we will be back, hopefully very soon! Thank you! Went with husband for a quick cup of tea……..saw the cakes and decided to stay longer! Huge selection of ‘proper’ teas, lovely home-made cakes and happy, enthusiastic staff. My husband and I Enjoyed a visit to this quaint little tea room today, I have to say it didn’t disappoint. They had an excellent range of home cooked cakes, I choose carrot and it was gorgeous! Staff were friendly and the prices were very reasonable. Will definitely be visiting again very soon!